Weddings by Palladium and we can’t wait to celebrate with you! Fabulous ceremony locations. Sweeping ocean views. The flexibility to tailor every detail to your wishes. Gorgeous resorts with an eco-friendly attitude. Five-star luxury experiences, unmatched amenities, and incredible value for you and your guests. Most importantly, all the planning managed by your own Wedding Coordinator, so you can focus on loving every minute of this sweet journey. CONTACT US so we can get this party started! Where will you live this exciting new chapter of your love story? Explore below and let us help you find the perfect beach destination for your celebration. Jamaica offers an unmatched combination of elegance, romance and excitement. Relax with your toes in the warm sand or take to the ocean for your choice of water sports activities. Costa Mujeres is home to some of Mexico’s most exquisite beaches and crystalline waters. Combining eco-friendly state-of-the-art architecture set among ancient mangroves and a 5-star luxury experience. Ibiza is one of the Pityusic islands and has magnificent beaches lapped by turquoise waters and a fabulous climate, spectacular cliffs and nature parks. Nestled between wild mountains and the pristine Pacific, Riviera Nayarit is filled with secret beaches, charming seaside villages, surf culture and stunning views. The volcanic Spanish island of Tenerife is one of the world’s most fascinating destinations, located off the northwestern coast of Africa in the Atlantic Ocean. Set among lush palms and endless golden beaches, Punta Cana offers romance, tranquility and luxury. 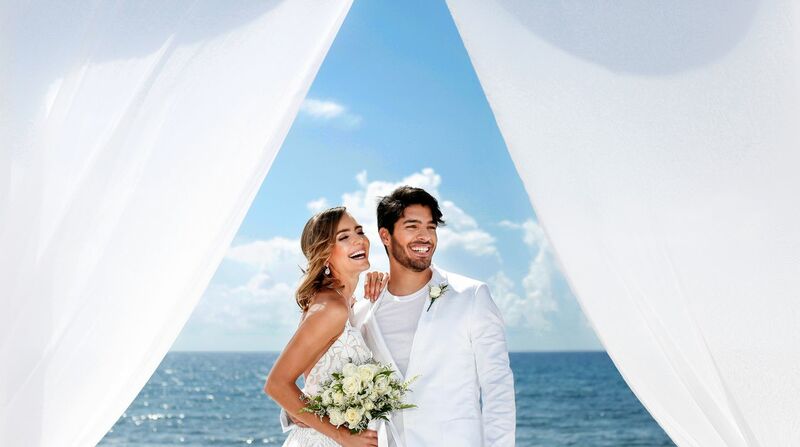 Surrounded by the warm Caribbean waters and the tropical air of the Mexican coast, Riviera Maya is a magical venue for unforgettable celebrations. Cap Cana is renowned for luxury and exclusivity. Nestled on the eastern shores of the Dominican Republic, it is home to a beautiful marina and spectacular views of the turquoise Caribbean Sea. To host a wedding at Palladium Hotel Group, you'll need to purchase a Ceremony Collection and secure your date with a deposit. We know you'll have more questions and we’ll be happy to answer each and every one of them. That's why we are here! We are honored and delighted to help you celebrate your love and we’ll take care of every detail so you can relax and enjoy this wonderful adventure.